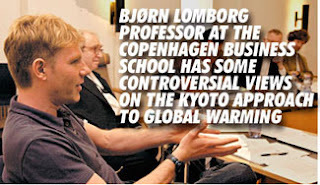 Bjørn Lomborg, professor at the Copenhagen Business School has some controversial views on the Kyoto approach to global warming. He believes the approach is unnecessarily complex and will yield far less than simpler ROI driven approaches. I agree with his thinking. Simple solutions like taxing plastic bags thus encouraging people to bring their own reusable cloth bags can achieve immensely beneficial results for our planet. This article in the Washington Post sums up his views brilliantly. Stop fighting over global warming — here’s the smart way to attack it. All eyes are on Greenland’s melting glaciers as alarm about global warming spreads. This year, delegations of U.S. and European politicians have made pilgrimages to the fastest-moving glacier at Ilulissat, where they declare that they see climate change unfolding before their eyes. Curiously, something that’s rarely mentioned is that temperatures in Greenland were higher in 1941 than they are today. Or that melt rates around Ilulissat were faster in the early part of the past century, according to a new study. And while the delegations first fly into Kangerlussuaq, about 100 miles to the south, they all change planes to go straight to Ilulissat — perhaps because the Kangerlussuaq glacier is inconveniently growing. I point this out not to challenge the reality of global warming or the fact that it’s caused in large part by humans, but because the discussion about climate change has turned into a nasty dustup, with one side arguing that we’re headed for catastrophe and the other maintaining that it’s all a hoax. I say that neither is right. It’s wrong to deny the obvious: The Earth is warming, and we’re causing it. But that’s not the whole story, and predictions of impending disaster just don’t stack up. We have to rediscover the middle ground, where we can have a sensible conversation. We shouldn’t ignore climate change or the policies that could attack it. But we should be honest about the shortcomings and costs of those policies, as well as the benefits. Environmental groups say that the only way to deal with the effects of global warming is to make drastic cuts in carbon emissions — a project that will cost the world trillions (the Kyoto Protocol alone would cost $180 billion annually). The research I’ve done over the last decade, beginning with my first book, “The Skeptical Environmentalist,” has convinced me that this approach is unsound; it means spending an awful lot to achieve very little. Instead, we should be thinking creatively and pragmatically about how we could combat the much larger challenges facing our planet. Nobody knows for certain how climate change will play out. But we should deal with the most widely accepted estimates. According to the United Nations’ Intergovernmental Panel on Climate Change (IPCC), ocean levels will rise between half a foot and two feet, with the best expectation being about one foot, in this century, mainly because of water expanding as it warms. That’s similar to what the world experienced in the past 150 years. Some individuals and environmental organizations scoff that the IPCC has severely underestimated the melting of glaciers, especially in Greenland. In fact, the IPCC has factored in the likely melt-off from Greenland (contributing a bit over an inch to sea levels in this century) and Antarctica (which, because global warming also generally produces more precipitation, will actually accumulate ice rather than shedding it, making sea levels two inches lower by 2100). At the moment, people are alarmed by a dramatic increase in Greenland’s melting. This high level seems transitory, but if sustained it would add three inches, instead of one, to the sea level rise by the end of the century. A one-foot rise in sea level isn’t a catastrophe, though it will pose a problem, particularly for small island nations. But let’s remember that very little land was lost when sea levels rose last century. It costs relatively little to protect the land from rising tides: We can drain wetlands, build levees and divert waterways. As nations become richer and land becomes a scarcer commodity, this process makes ever more sense: Like our parents and grandparents, our generation will ensure that the water doesn’t claim valuable land. The IPCC tells us two things: If we focus on economic development and ignore global warming, we’re likely to see a 13-inch rise in sea levels by 2100. If we focus instead on environmental concerns and, for instance, adopt the hefty cuts in carbon emissions many environmental groups promote, this could reduce the rise by about five inches. But cutting emissions comes at a cost: Everybody would be poorer in 2100. With less money around to protect land from the sea, cutting carbon emissions would mean that more dry land would be lost, especially in vulnerable regions such as Micronesia, Tuvalu, Vietnam, Bangladesh and the Maldives. As sea levels rise, so will temperatures. It seems logical to expect more heat waves and therefore more deaths. But though this fact gets much less billing, rising temperatures will also reduce the number of cold spells. This is important because research shows that the cold is a much bigger killer than the heat. According to the first complete peer-reviewed survey of climate change’s health effects, global warming will actually save lives. It’s estimated that by 2050, global warming will cause almost 400,000 more heat-related deaths each year. But at the same time, 1.8 million fewer people will die from cold. On the other hand, we could spend $3 billion annually — 2 percent of the protocol’s cost — on mosquito nets and medication and cut malaria incidence almost in half within a decade. Malaria death rates are rising in sub-Saharan Africa, but this has nothing to do with climate change and everything to do with poverty: Poor and corrupt governments find it hard to implement and fund the spraying and the provision of mosquito nets that would help eradicate the disease. Yet for every dollar we spend saving one person through policies like the Kyoto Protocol, we could save 36,000 through direct intervention. Wherever you look, the inescapable conclusion is the same: Reducing carbon emissions is not the best way to help the world. I don’t point this out merely to be contrarian. We do need to fix global warming in the long run. But I’m frustrated at our blinkered focus on policies that won’t achieve it. The Kyoto Protocol is set to expire in 2012. U.N. members will be negotiating its replacement in Copenhagen by the end of 2009. Politicians insist that the “next Kyoto” should be even tougher. But after two spectacular failures, we have to ask whether “let’s try again, and this time let’s aim for much higher reductions” is the right approach. Even if the policymakers’ earlier promises had been met, they would have done virtually no good, but would have cost us a small fortune. The climate models show that Kyoto would have postponed the effects of global warming by seven days by the end of the century. Even if the United States and Australia had signed on and everyone stuck to Kyoto for this entire century, we would postpone the effects of global warming by only five years. The typical cost of cutting a ton of CO2 is currently about $20. Yet, according to a wealth of scientific literature, the damage from a ton of carbon in the atmosphere is about $2. Spending $20 to do $2 worth of good is not smart policy. It may make you feel good, but it’s not going to stop global warming. We need to reduce the cost of cutting emissions from $20 a ton to, say, $2. That would mean that really helping the environment wouldn’t just be the preserve of the rich but could be opened up to everyone else — including China and India, which are expected to be the main emitters of the 21st century but have many more pressing issues to deal with first. We must accept that climate change is real and that we’ve helped cause it. There is no hoax. But neither is there a looming apocalypse. To some people, cutting carbon emissions has become the answer, regardless of the question. Cutting emissions is said to be our “generational mission.” But don’t we want to implement the most efficient policies first? Combating the real climate challenges facing the planet — malaria, more heat deaths, declining polar bear populations — often requires simpler, less glamorous policies than carbon cuts. We also need to remember that the 21st century will hold many other challenges, for which we need low-cost, durable solutions. I formed the Copenhagen Consensus in 2004 so that some of the world’s top economists could come together to ask not only where we can do good, but at what cost, and to rank the best things for the world to do first. The top priorities they’ve come up with are dealing with infectious diseases, malnutrition, agricultural research and first-world access to third-world agriculture. For less than a fifth of Kyoto’s price tag, we could tackle all these issues. Obviously we should also work on a long-term solution to climate change. Solving it will take the better part of a century and will require a political will spanning political parties, continents and generations. If we invest in research and development, we’ll do some real good in the long run, rather than just making ourselves feel good today. One more happy customer! Yipee! “I ordered 1000 bags from Norquest in August 2007 for Alternatives For Girls – the nonprofit agency I work at in Detroit, Michigan. I was extremely impressed with their prompt responses, attention to detail, and professional attitude. On top of that, the bags were delivered exactly on time and looked beautiful! Their website is an excellent gauge of how organized and professional this company is. I was able to view pictures of all the different bags, including pricing and dimensions. My inquiries were responded to within a day. And placing an order was very simple and clear. We have given these bags to our staff, volunteers, and donors as a gift to show our appreciation for their dedication, service, and generosity. We couldn’t have asked for a better gift than these bags because everyone loved them! They appreciated a quality gift they can actually use instead of wondering what to do with it. And the best part, the bags were completely affordable for a nonprofit agency on a small budget. Finally, we were able to imprint our logo and website on the bags, which will be publicity for our agency for many years! We will definitely use Norquest again to purchase our next set of canvas bags. Thank you Mahima, thank you for taking the time to say this. You made our day! We will look forward to being off service again one day soon. Did we save the world from 250 million plastic bags last year? According to Morsbag, maybe we did! I wrote to Pol at Morsbags.com to find out how it all started. Here’s Pol telling us how she got going “How did we start? We started overnight in January 2007 due to frustration of seeing plastic bags floating down the canal where we live in London (on a houseboat). I had the idea, phoned mum to come up with a simple design and asked my fiancé Joseph to design a web page that night so that we could share the pattern, encourage people to join in and raise awareness of the horrific harm that plastic bags can cause to marine wildlife. I was devastated to find the news about the dead Minke whale washed up in Normandy, France with it’s stomach full of plastic bags and wanted to do something immediate and positive to help, rather than just saying no to plastic bags; the idea of giving them away to compete against the free supermarket ones seemed like the only answer – we reckon each morsbag potentially replaces 500 plastic bags! Over 5200 have now been made. They’re extremely easy and surprisingly addictive to make. So, at HQ, it’s just me and Joseph, but there are 200 ‘pods’ (groups or individuals) all over the UK, America, New Zealand, Spain, France etc who have joined us to make morsbags out of their old curtains, duvet covers and pillow cases, enjoying glasses of wine and sewing, before distributing them, guerilla style for free to the public. People in pods meet whenever they want and others set up bag making workshops. They also get together to hand out the bags on handout days (such as Oct 13th and Dec 1st) although if shy, some people prefer to give them to friends, relatives, colleagues or post them through letterboxes, give them out at school etc. People in “pods” meet whenever they want and others set up bag making workshops. They also get together to hand out the bags on handout days (such as Oct 13th and Dec 1st) although if shy, some people prefer to give them to friends, relatives, colleagues or post them through letterboxes, give them out at school etc”. Well done, Pol! What you are doing is heartening and I wish you great success. I wish we could learn how to bring people together for the cause in this manner. We at Norquest also share in her pride. I’ve often wondered how many plastic bags each of our bags substitutes. I live in India and have no way to observe what people in the West do when they receive a cotton bag. If, as Pol assumes, every one of the roughly 5,00,000 bags we sold last year caused people to use 500 less bags, that’s a total of 250,000,000 – 250 million plastic bags less polluting our earth! Sure feels good!